Three first half goals saw Gary Locke’s Raith Rovers rediscover winning ways at Starks Park this afternoon, despite a spirited comeback from visitors Dumbarton. 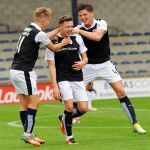 Kevin McHattie, Ross Callachan, and Scott Roberts all found the net in a first-half in which Raith dominated, putting Rovers level on points in third place in the Scottish Championship table. A plucky Dumbarton side made their hosts sweat with two second-half goals nearly stealing a point, with a comeback inspired by experienced substitute Ryan Stevenson. The visitors’ momentum was lost with the late sending-off of defender Gregor Buchanan, for his second hefty challenge in a difficult day for the Dumbarton rear-guard. In a season which has already seen some fine goals from Rovers players, Scott Roberts’ goal in particular was a real highlight. Despite the close-ness of the final score, Raith were in clear control for seventy minutes, winning key individual battles across the park, and showing a sense of purpose through midfield that augurs well for this season’s campaign. Injuries have caused manager Gary Locke more than a few headaches of late. Welcoming back goalkeeper Kevin Cuthbert on one hand, the Raith manager had to make do without Jason Thomson, Lewis Vaughan, Craig Barr, and Scott Robertson to injury on the other. Full-back Liam Smith was sourced from Tynecastle on an emergency loan, and went straight into the first team. Veteran Rudi Skacel also started his first League match of the campaign, alongside Declan McManus. Manager Steve Aitken has found achieving any sort of rhythm difficult with his Dumbarton side. A win over Dundee United in August was the last time Dumbarton tasted victory. Several low-scoring defeats and draws recently stand in contrast to their early-season form – Dumbarton hit three goals twice earlier in the season, only to lose on both occasions. Former Brechin striker Robert Thomson started upfront in an attack that included former Raith winger David Smith as one of two very advanced wingers. Goalkeeper Alan Martin has impressed this season, having moved from Premier League Hamilton in the summer – he was a key figure today keeping Dumbarton within touching distance with a number of good saves. Although neither side had won in their last four, the match started positively. Under heavy grey skies and in muggy conditions, Dumarton’s Smith and Stirling started pressing high up against Raith’s full-backs, giving the visitors a four-man front-line in the opening exchanges. Two early corners seemed a statement of intent. New full-back Liam Smith showed his quality early on – sure with both feet and confident in possession, Kirkcaldy-born Smith looked at home in the Raith defensive quartet. 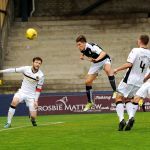 Linking well with Bobby Barr on the right flank and showing a willingness to step inside in advanced positions, Smith looked assured as Raith established themselves as the match moved beyond the first five minutes. Barr allowed Roberts to shoot at Martin, Barr McManus and Callachan combined to cause problems for a retreating Buchanan, and M’Voto charged powerfully at a Barr corner. On the quarter-hour, Raith led. Moments after Skacel had forced a great save from Martin after a mistake by visiting captain Barr had left the Czech clean in on goal, McHattie collected a flick from Callachan, set himself, and shot powerfully across Martin from twenty yards – a fine strike to put the hosts a goal to the good. 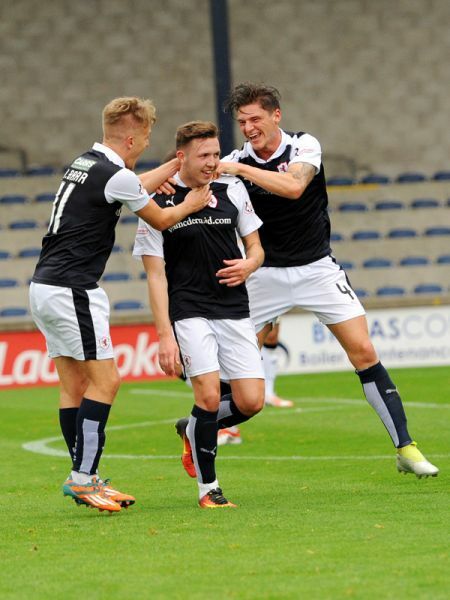 The goal started from deep in Raith territory, with Skacel finding Roberts in space, and Callachan finding his full-back in full sail with a fine flick. In the dug-out, Locke and Darren Jackson nodded in approval at the well-worked opener. 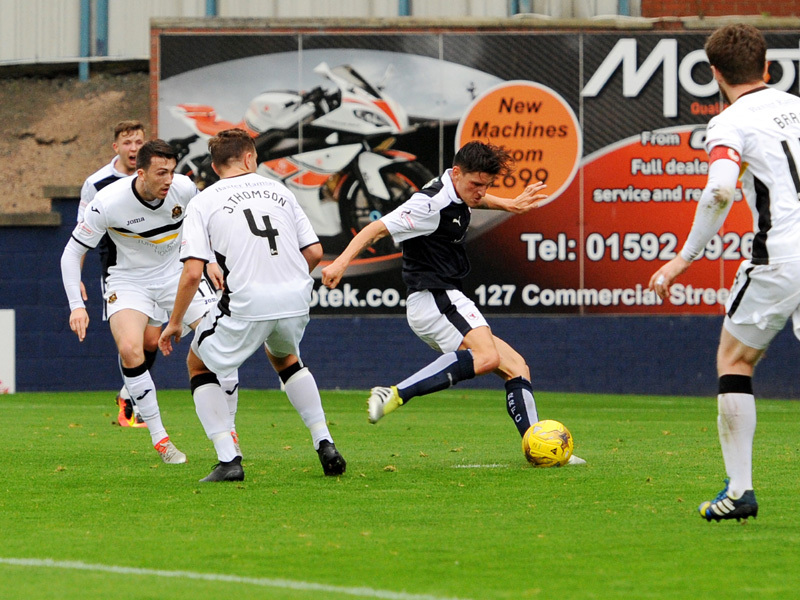 Callachan was controlling the middle of the park as Raith looked to score again. 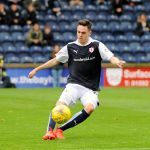 Impressive in his work-rate and his distribution, the young Raith midfielder exhibited a coolness and authority in the opening half, rarely losing possession and involving team-mates well. He fired wide after a lay-off from McHattie on twenty minutes. McManus brought a fine save from Martin soon after, his drilled shot parried away. Despite their bright opening, Dumbarton failed to make headway in the first half. It was twenty minutes before they managed a shot on target – Smith lashing straight at Cuthbert from the edge of the area. 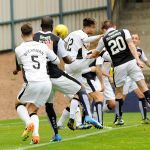 However, notwithstanding Raith’s control of possession, Dumbarton caused problems from the set-piece – midway through the half, Joe Thomson’s inswinging free-kick caught full-back Harvie’s knee, deflecting narrowly over Cuthbert’s bar. The full-back held his head, knowing an unlikely equaliser had gone begging. Later in the half, striker Robert Thomson would head wide from a similar position. While two goals would have been more than their first-half endeavours warranted, Cuthbert would count himself fortunate to have a clean-sheet at the half. The first half truly came to light in a two-minute spell after the half-hour. Straight after Harvie’s miss for Dumbarton, Barr fed Callachaninside, and the young Raith midfielder fired low at goal, a deflection taking the ball beyond Martin for Raith’s second. A minute later, the match’s one moment of genuine quality – with time to set himself, Roberts fired a thunderbolt from an angle, rising beautifully into Martin’s top left-hand corner. The Dumbarton ‘keeper was rooted, and the crowd rose to their feet to cheer a goal from the top drawer. Manager Aitken made two changes at half-time, seeking to bring some life into his side – withdrawing Pettigrew from right-back, drawing David Smith back, and introducing Josh Todd and former Hibs man Sam Stanton. It was Raith though who set the early tempo – only sixteen seconds had passed before Skacel fired in a pile-driver after a surge from McManus, drawing a flying save from Martin. 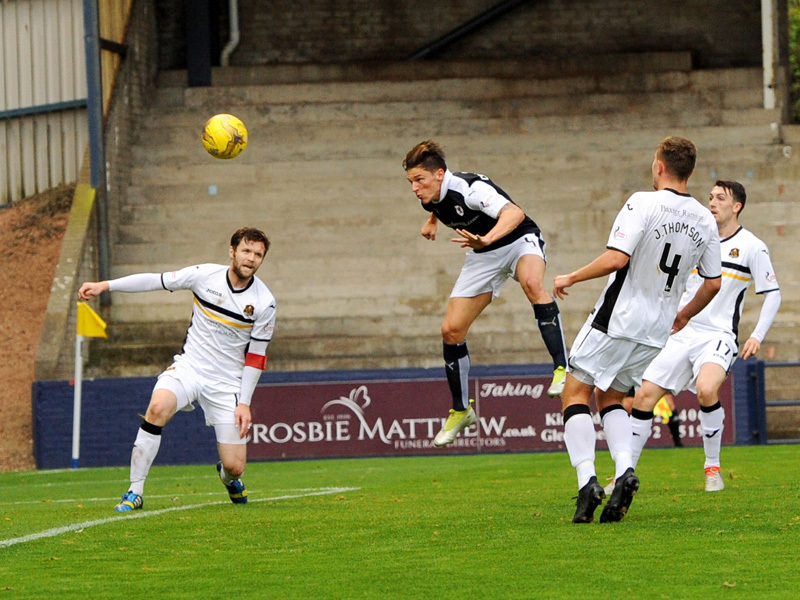 Raith had chances to add to their three-goal lead. Skacel’s cross was volleyed high and wide by Roberts, M’Voto thundered a header over Martin’s bar, and Callachan should have scored with a header after another perfect invitation from his Czech midfield colleague. On sixty-five minutes, Dumbarton’s last substitution saw the introduction of Ryan Stevenson. While pace is no longer his strongest suit, Stevenson brought a solidity and strength to Dumbarton’s midfield that had been missing up till that point. Almost single-handedly, he raised the visitors’ standard on half-way, leading attacks against the hitherto under-employed home defence. Within moments, Thomson’s header troubled Cuthbert. Shortly after, substitute Stanton scampered beyond McHattie, pulling back a cross which Thomson narrowly failed to convert. On seventy-one minutes, Stevenson stamped his authority on the second half. Having found space in front of Raith’s back-four, he brought a bouncing ball under his command and contemptuously smacked home a fine controlled drive from twenty-five yards. Five minutes later, Raith’s advantage was just one. Todd’s cross found Stanton in the Raith box, and amidst the scramble, Robert Thomson got the final touch to prod home in front of Cuthbert. 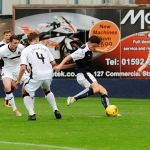 Despite being second-best for long spells, the visitors’ substitutes had all made an impact and the course of the game had been turned – from a first-half of assuredness and composure, Raith were now struggling to clear their lines and to retain possession. Stewart had been introduced for Skacel, and the diminutive Chris Johnston for the tiring Roberts to re-set Raith’s nerves. For Dumbarton’s part, they had battened down hatches when necessary, and with quarter of an hour to go, looked as likely to equalise as Raith looked to steal a fourth. The match lost some discipline as tempers frayed – Stewart was booked for throwing the ball away, Buchanan saw yellow for a hack at McManus after a lovely turn from the Raith man, and Stevenson was booked for clashing with Davidson. 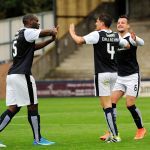 With Stevenson having volleyed wide on eighty-six minutes, Dumbarton’s cause seemed lost as Stewart escaped beyond Buchanan – the visiting centre-half arriving late, bundling the Raith man to the floor. 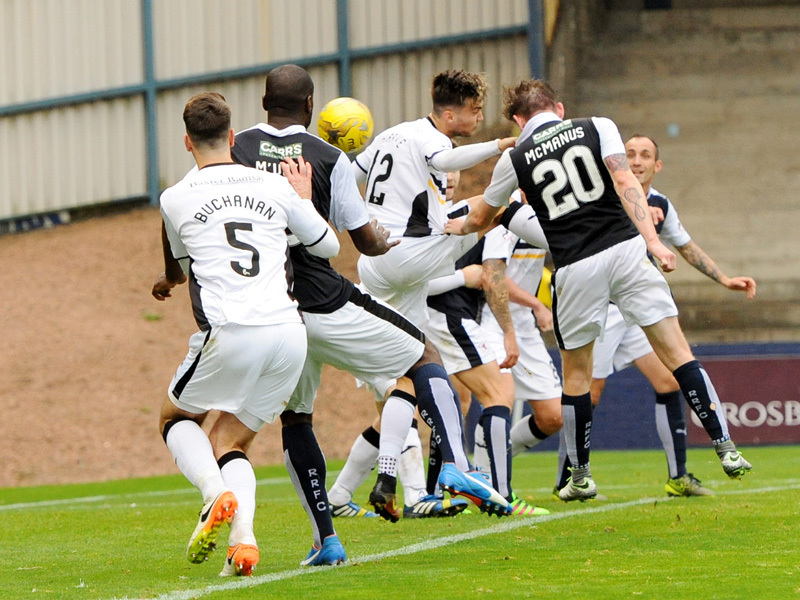 Referee Kirkland had no hesitation in issuing a second yellow, reducing Dumbarton to ten men. 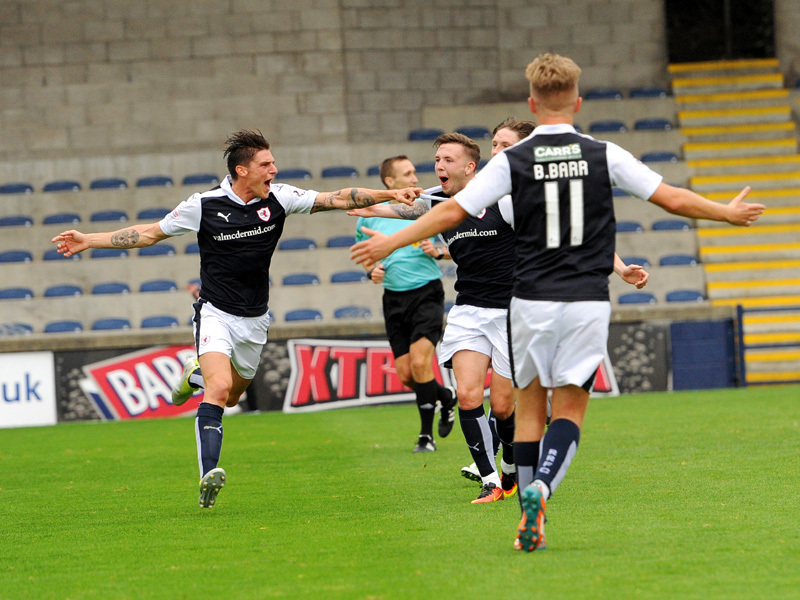 From that point, Raith were able to see out the final minutes to ensure all three points stayed in Kirkcaldy. Stanton’s late drive through a forest of legs was well held by Cuthbert, while the excellent McManus was rewarded with a rousing cheer from the Kirkcaldy faithful on his withdrawal for last-minute substitute Jordan Thomson. With Raith fans nervously recalling Dumbarton’s three-goal comeback from last-year, the final whistle drew relieved cheers from the home support. Manager Gary Locke headed straight to the dressing room to deliver his post-match assessment to his players – delighted no doubt with the three points, but with concerns as a match which should have been in the bag on the hour threatened to slip from Raith’s grasp following astute substitutions from his opposite number in the Dumbarton dug-out. 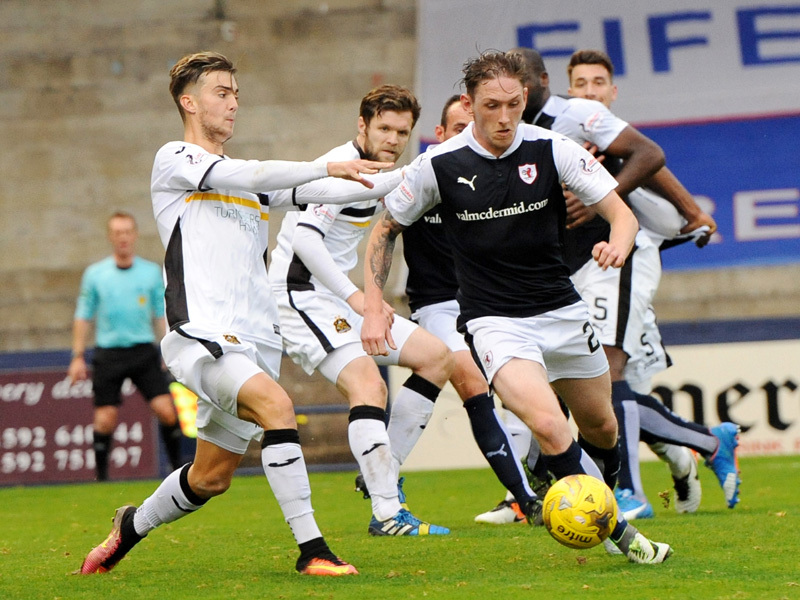 Raith sit joint-third for now, but with games against each of the League’s top three sides in October, the manager will be keen to drive a greater concentration from his players to last the full ninety minutes. Welcome to Starks Park for an important fixture against Dumbarton. Kevin Cuthbert returns between the sticks though - welcome back Cat!!! Callachan slips while shooting and it goes wide. Good football down the left wing again. 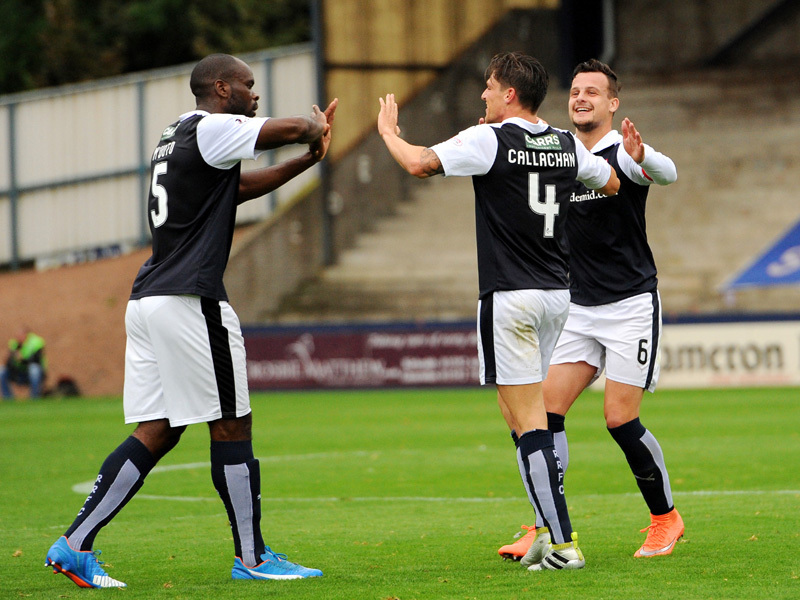 Raith race straight up the park, and Callachan eventually slots the ball past Martin for number 2! 3-0!!! An absolute beauty in to the postage stamp corner from Roberts!!! A guy just walked up the stairs with an early pie and bovril, having missed two goals! At half time there are only three goals in the four Championship games. Efficient. +3 Full time! 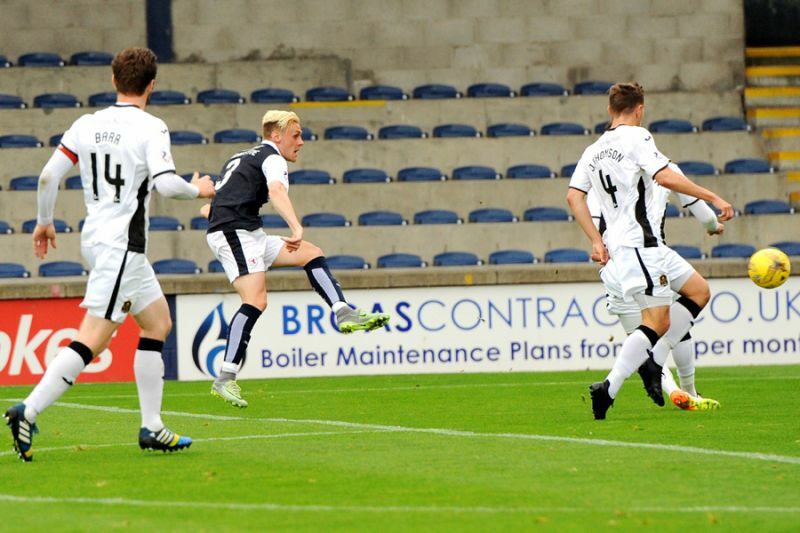 Raith hold out in the face of a Dumbartonesque comeback by Dumbarton! Steve Aitken’s Dumbarton side are the visitors to Stark’s Park this weekend, with both teams aiming to put a stop to winless runs which stretch back to August. 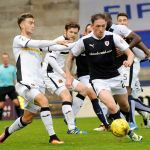 While Raith’s last victory came in that month’s Kingdom derby on the 20th, Dumbarton’s last three point haul came at the expense of Dundee United a week earlier, with the 1-0 triumph their only league win to date. That sequence has witnessed Rovers slip from second to third, but the Sons two draws since then, coupled with Dunfermline and St. Mirren’s poor form, has seen them move up to eighth. After last season saw Dumbarton finish just above the relegation play-off place, manager Steve Aitken embarked on a summer squad restructure, with a raft of new additions to the roster. Goalkeeper, Alan Martin was brought on board from Hamilton, and he’s already proven an astute acquisition, with a number of fine performances this term. Full-backs, Craig Pettigrew and Daniel Harvie arrived from Stranraer and Aberdeen, while an abundance of midfield options were brought in to the fold. Sam Stanton was signed on-loan from Hibernian, while former Hearts winger David Smith headed to the Cheaper Insurance Direct Stadium after his release from Falkirk. Josh Todd was snapped from Annan Athletic, Ryan Stevenson from Ayr United and Joe Thompson was brought in on-loan from Celtic. Left-winger Andy Stirling also joined up with his boss again, with the midfielder a stand-out performer during Aitken’s tenure at Stranraer. Up-front, Robert Thomson was acquired following a fine end to last season with Brechin City, where his goals helped secure the Glebe Park side an eighth placed finish, after being bottom of League One for much of the campaign. This fixture has a history of producing goals, with last season alone featuring a 3-2 win for Raith, and an unforgettable 3-3 draw, when Rovers let-slip a three goal lead with just ten minutes remaining. Since being reaquiainted in this tier in the 2012-13 campaign, the two have produced 63 goals in the 16 league meetings, with Dumbarton’s last win coming back in 2014, with a 2-1 home win. Due to this, Raith have a good recent record in the fixture, with four wins and four draws from the last ten meetings. Saturday’s match referee is Steven Kirkland.